This morning we stopped by TI's power management group to check out what all they had in store, and got to check out some demos of their new second generation wireless power chipsets. 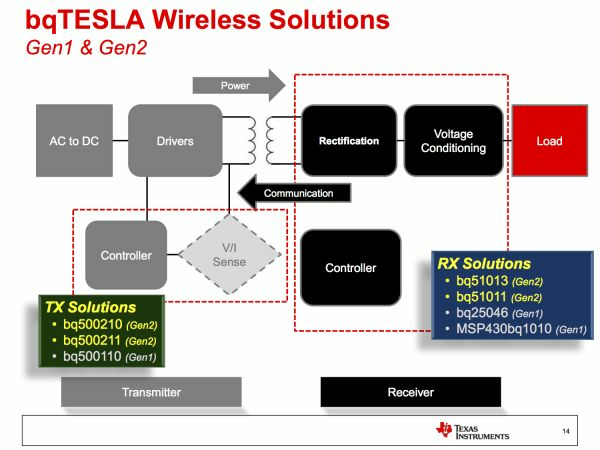 The new solutions meet the 5W Wireless Power Consortium (Qi) standard, and have a smaller total package area. TI demoed the BQ51013 second generation small form factor power Rx PCB charging a variety of devices, including a Kindle. In addition, TI has some newer small form factor (BQ5002010 and BQ5002011) charging Tx solutions that further reduce BOM cost and require lower input voltage compared to their first generation counterparts. TI also briefly teased its upcoming 10W solution charging an iPad 2. Though the current standard is just 5W for smartphones (1A@5V) obviously charging tablets and larger devices is something coming down the road for the Wireless Power Consortium. At present, inductive chargers achieve around 70% efficiency. At present, inductive chargers for smartphones generally require an external sleeve or accessory battery cover with the inductive coil and charger inside. Newer second-generation Rx solutions will drive down the size of the inductive charging solution, and inductive coils PCB (instead of hand-wound coils) will make it possible to eventually also make including wireless charging support on the boards themselves. You haven't used a TouchPad or a Pre have you? Touchstone makes plugging in USB over and over look ridiculous. I also think touchstone means I use the TouchPad more often - no effort to charge, just drop it on the stand, you don't even have to line it up exactly. I wish this thing had an edit button. Further to this, all phones are STILL going to have microUSB, so it's not like that choice is stolen from you. I completely agree with everything said above. I use my Touchpad a lot more now that I can just grab it, use it and set it back on the Touchstone for charging. Also helps if you have cats or kids who like to tug on cables, of which I have both. It sounds like we're just lazy and bought a gimmicky product but it really does seem to change the way you use it. I do think $50 (originally $80) is a ridiculous price but I purchase mine for $30 and would do it again in an instant.